Reply 'For Mr Corbet of Dumfries', giving advice for dealing with the patient's 'obstinate but not dangerous' complaint and a recipe to help with the pain in his bowels. 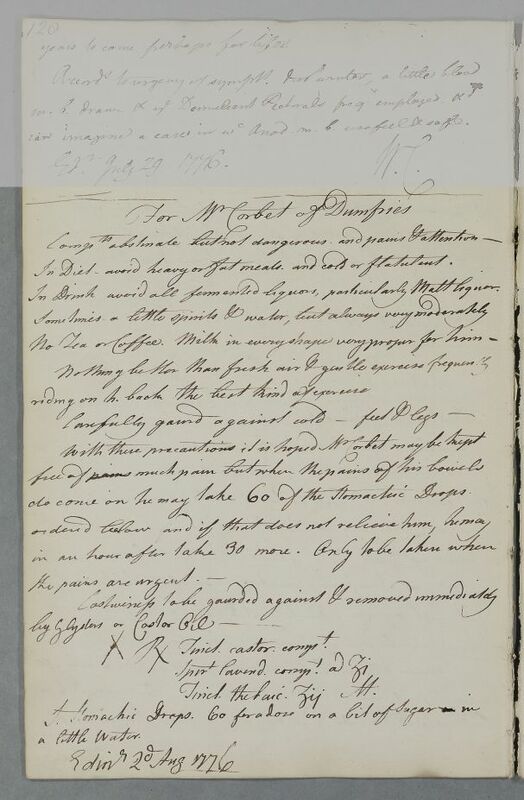 Summary Reply 'For Mr Corbet of Dumfries', giving advice for dealing with the patient's 'obstinate but not dangerous' complaint and a recipe to help with the pain in his bowels. Case of Mr Corbet of Dumfries who is prescribed a regimen and stomach medicine. In Diet avoid heavy or fat meals and cold or flatulent. In Drink avoid all fermented liquors, particularly Malt liquor. riding on horseback the best kind of exercise. riding on h.back the best kind of exercise.